Join the discussion on our forums! Come discuss Whirlwind Tempest over in our dedicated Whirlwind Tempest discussion topic. So .... Witch's Brew loses the Echo keyword, but this card gets a keyword that exists on *no single* other *collectible* card? 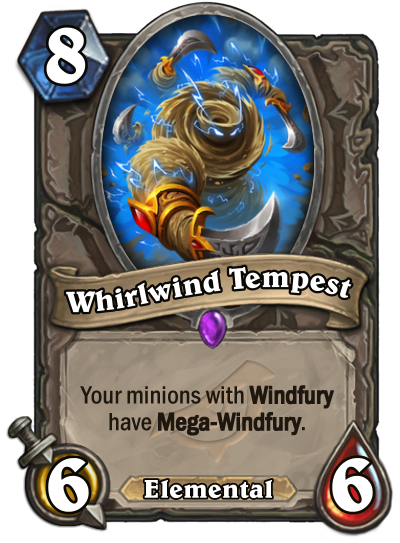 It's easier to just add Mega in front of Windfury, that's self-explanatory. What would your decision be instead? I mean, I personally have less of a problem here with the mega than with the missing echo on witchs brew. in some sense i can understand that they want to let "echo" to be a WW-only keyword. but megawindfury existed only in GvG on a single legendary (well, and on a weapon in KnC adventures). to me it makes no sense. yeah because in constructed you often have a 7 attack minion survive a turn after turn 10, and no taunt. If so why is Blessed Champion never seen play? It's the same 10 mana 2 card combo that quadruple the attack. Blessed Champion has that downside it's not a minion - these cards, even if you don't pull of the wombo-combo, can do something, while a 5 mana spell that might wiff completely (either blocked by taunts, secrets, not able to hit a big attack minion...) is a pretty big risk. Also, it doesn't quadruple attack unless it's on a windfury minion, and there's not enough of those for paladin - shaman can make better use of elementals etc. That sounds pretty meta defining. Inb4 Flare making it's comeback. On Un'Goro, or rather, slightly before its release, we had all received a Volcanosaur pre-release, and boy was it fun to play it with Rogue, pray for a windufry, and conceals and cord blood on it. Sap and rest was fine to clear away for its OTK. Honestly, even Walking Fountain alone makes this look almost reasonable. Too bad all the elemental synergies are rotating out. This could work if you can play this, take down their taunts and ping a sole minion with Windfury that has high enough damage. Even a minion with 5 damage would be hitting for 20 to the face. That said, if this minion was 7 mana it would be broken beyond belief. Think it has potential in a Shaman burst damage style deck with murlocks and elementals. Definitely interesting though asidefrom from a boomship combo the extremely high cost makes this very difficult to set up or keep on the board, it generates way to much threat. Now if only there were any decent windfury minions outside of Shaman. This card can be played on the same turn as Windfury. That being said, if you have a 7-8 attack minion, you could deal some game ending surprise face damage.